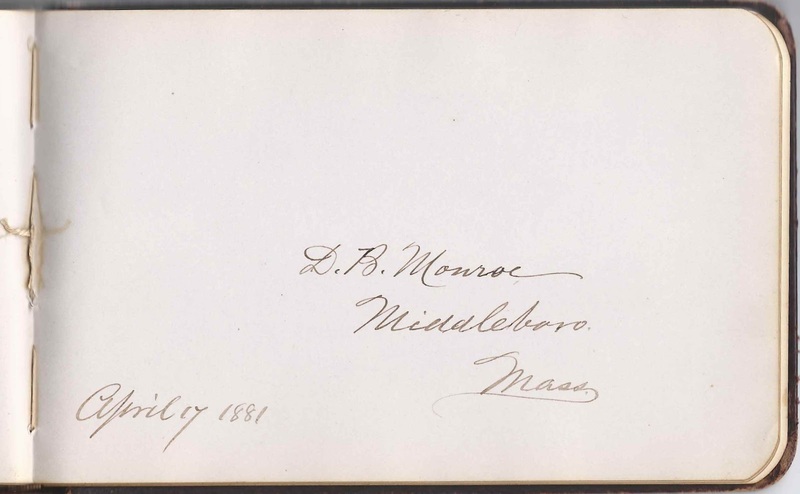 Martha Jane Munroe was born 13 January 1837, the daughter of William and Sophia (Williams) Munroe/Monroe. 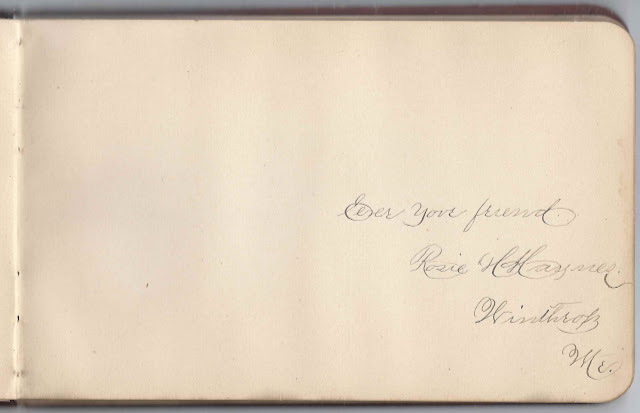 She married George Alfred Dunham, son of Schuyler and Sally (White) Dunham. 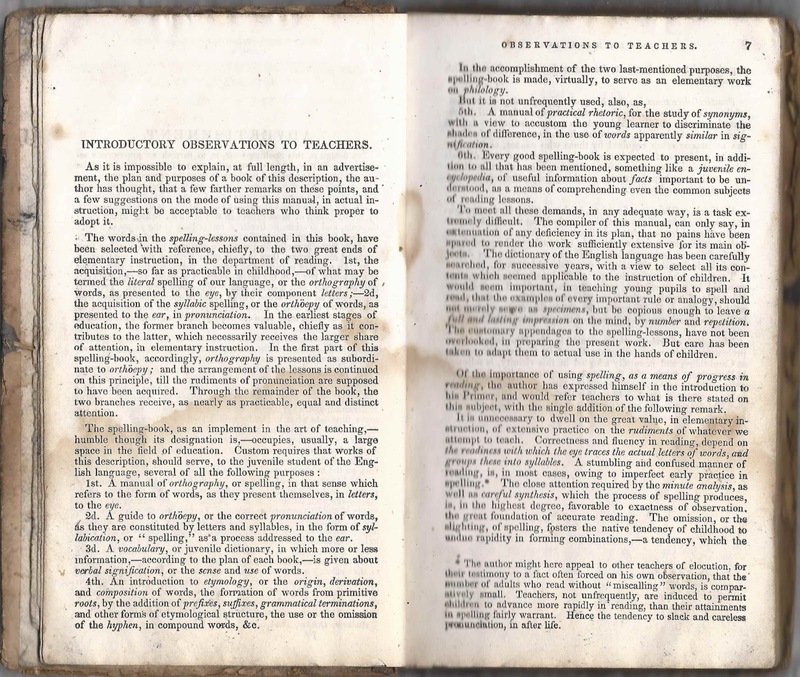 George was born 12 July 1836. 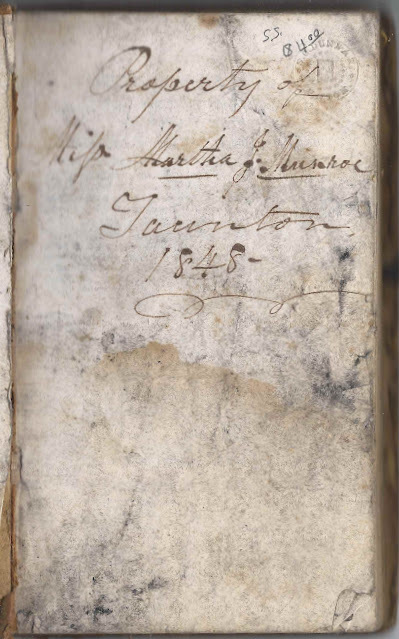 They were living at Taunton, Massachusetts, at the time of the 1880 Census; Norton, Massachusetts, at the time of the 1900 Census and Attleborough, Massachusetts, at the time of the 1910 Census. Martha died in 1916 and George in 1920. 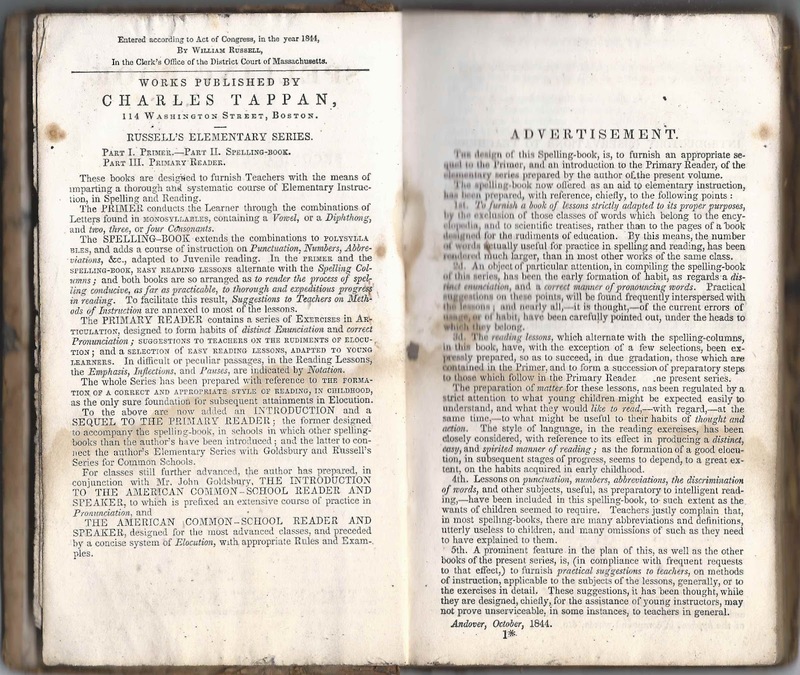 They're buried at Oakland Cemetery at Taunton, Massachusetts, with two of their children, Georgietta Dunham and Erford Clinton Dunham. 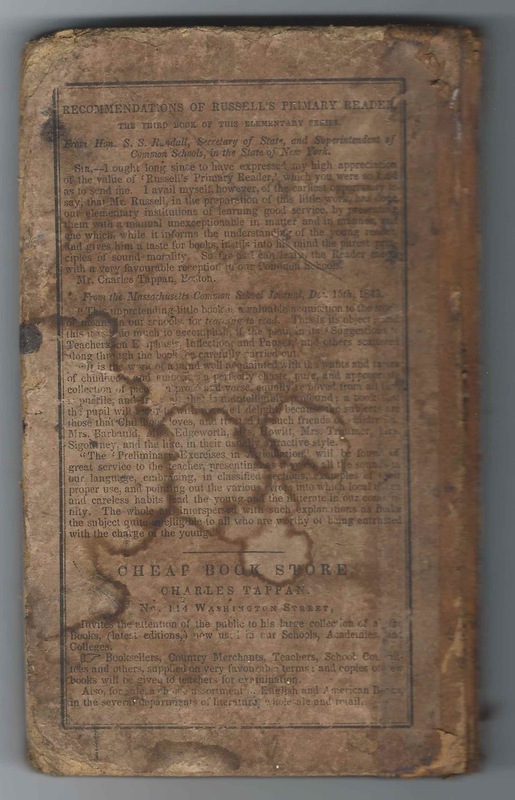 Their grandson, Howard C. Dunham, son of George Alfred Dunham, Jr., and Helen Tew (Lane) Dunham, is also buried with them. 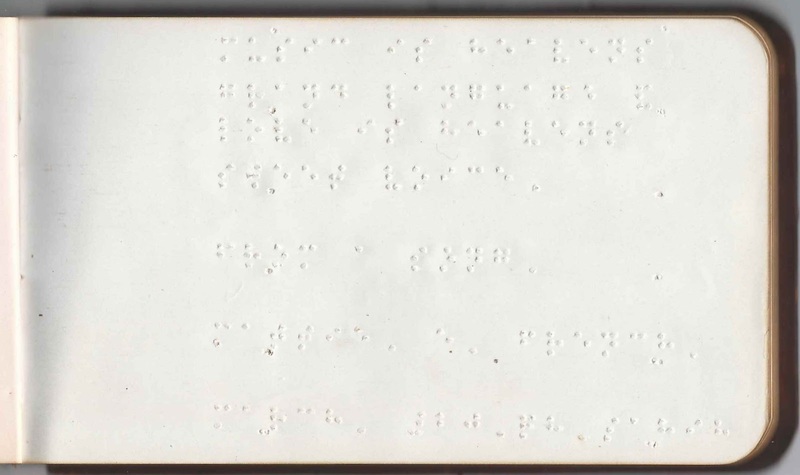 Howard was born 26 January 1896 and died 13 August 1896. 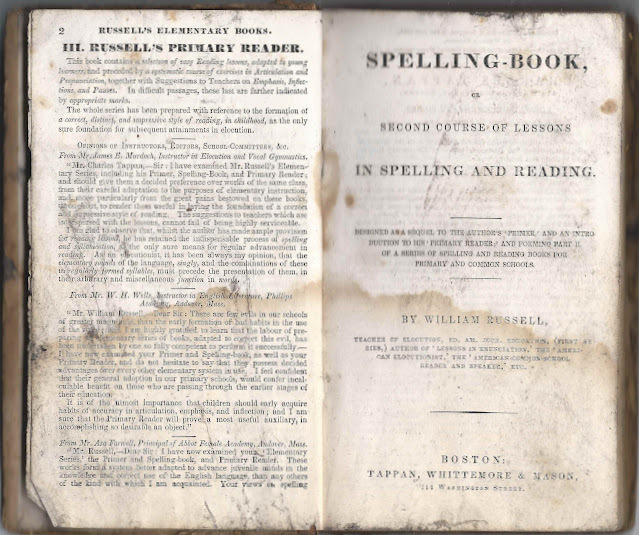 The spelling book was published by Tappan, Whittemore & Mason, 114 Washington Street, Boston, Massachusetts about 1844. 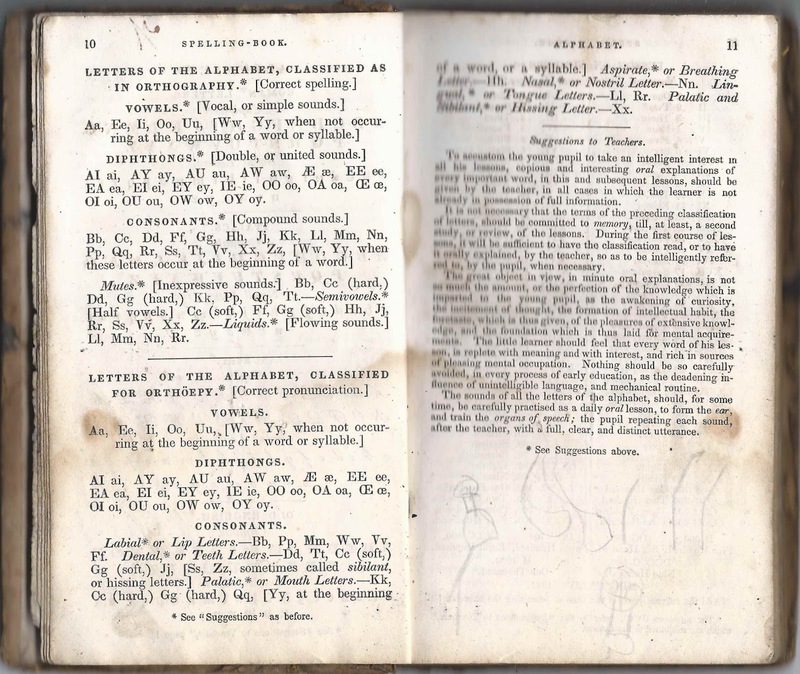 Below are images of a few pages, some with doodling on them. 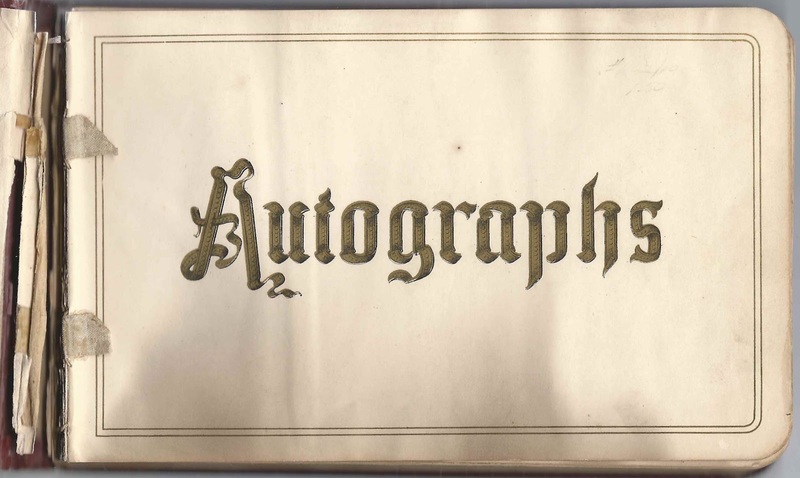 1908-1912 autograph album that belonged to a Viola of the Westport, Massachusetts, area. She may have been Viola M. Briggs, daughter of Albert Bradford Briggs and Mary Elizabeth (Sherman) Briggs and future wife of Lester Clifford Lawson, whose 1890s-1910s autograph album was featured in another post. 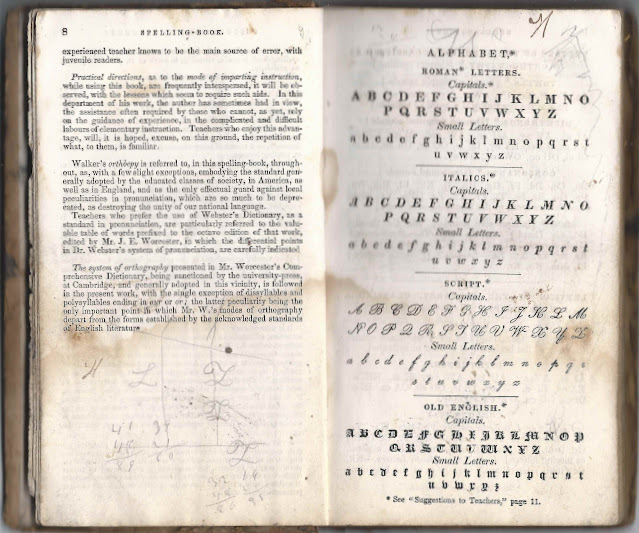 Several of the signers indicated they were students at the school Rogers and Allens' at Fall River, Massachusetts. 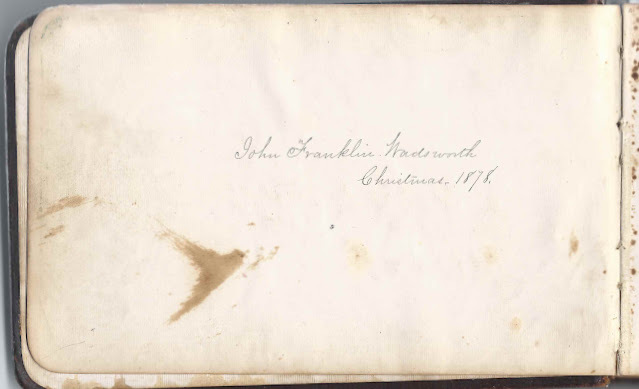 A handwritten card with the school's name is inserted in the album. 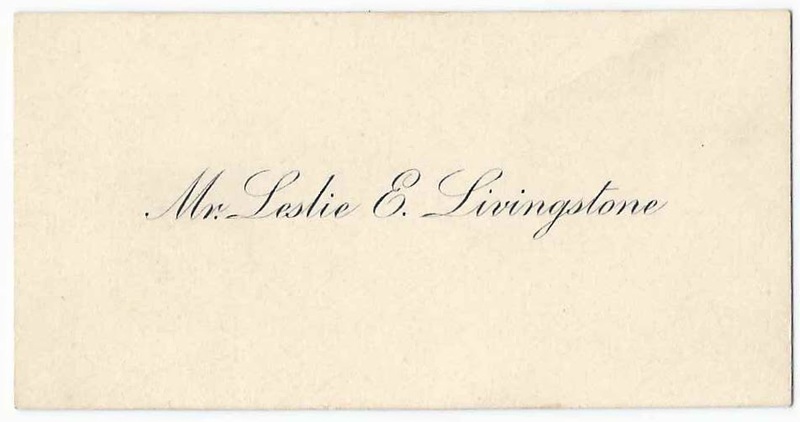 One of the signers, Leslie E. Livingstone sketched himself in a Rogers & Allens' jersey and included his calling card. 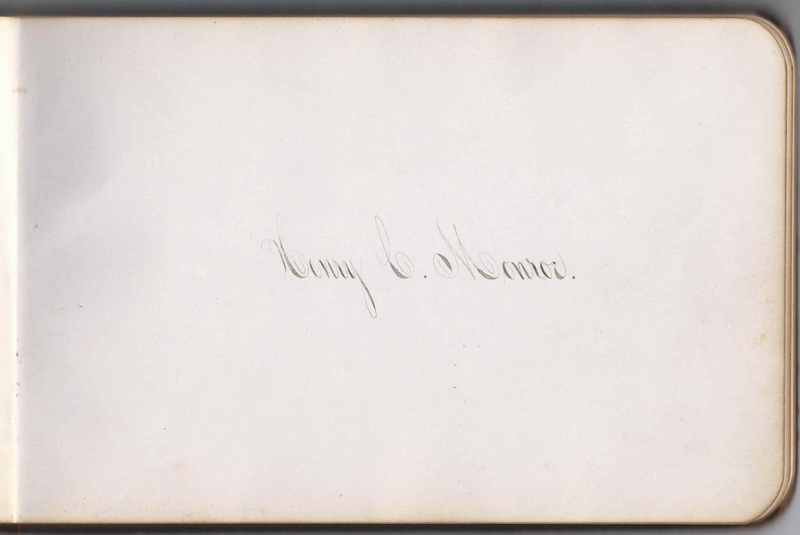 He gave his address as 1232 Plymouth Avenue, Fall River, Massachusetts. 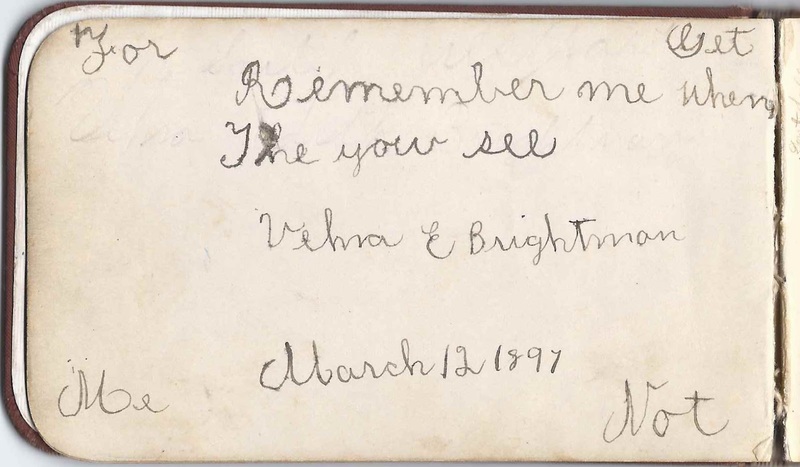 The album is approximately 7-3/4" x 5" and contains the sentiments of 54 of Viola's schoolmates, friends and possibly relatives. 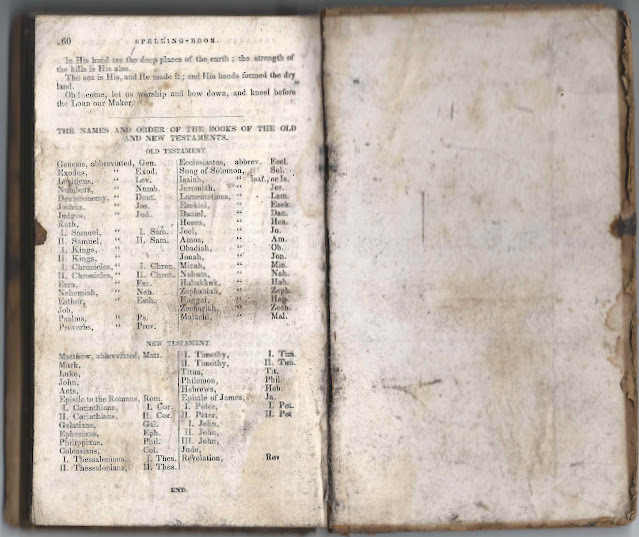 An alphabetical surname list and an alphabetical list of the signers, complete with any residential and school information they offered, appear at the end of this post. 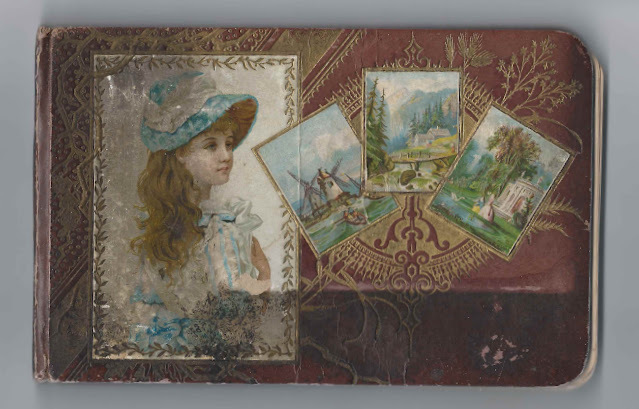 Viola M. Briggs was born 27 April 1893 at Westport, Massachusetts, the daughter of boat builder Albert Bradford Briggs and Mary Elizabeth (Sherman) Briggs, who were both Westport, Massachusetts natives. 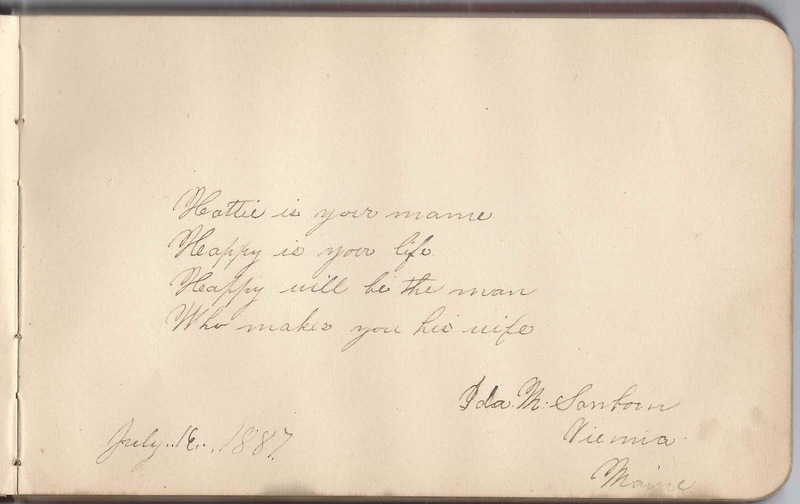 On 29 July 1917, Viola married Lester Clifford Lawton, son of Isaac Macomber Lawton and Annie D. (Lawton) Lawton. 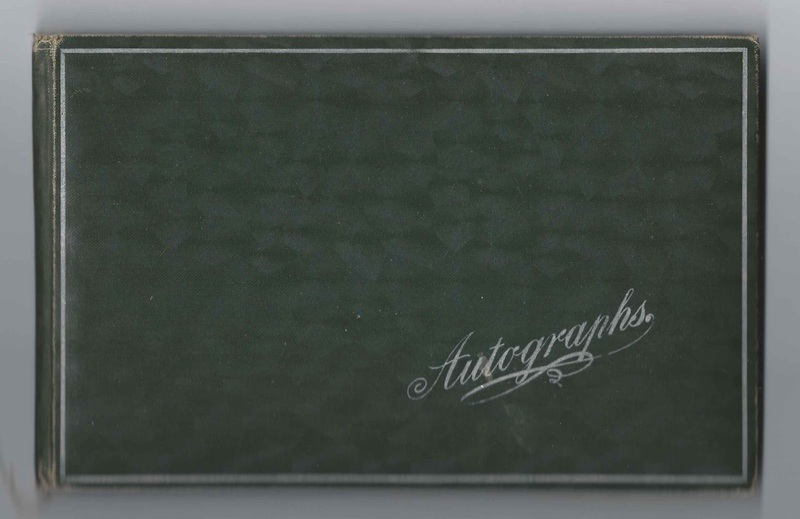 Lester was born 7 June 1890 at Westport, Massachusetts. 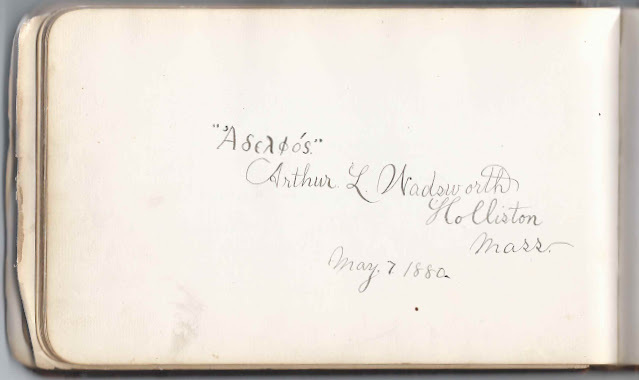 Viola and Lester made their home at Westport, Massachusetts, and had at least one child, a daughter. 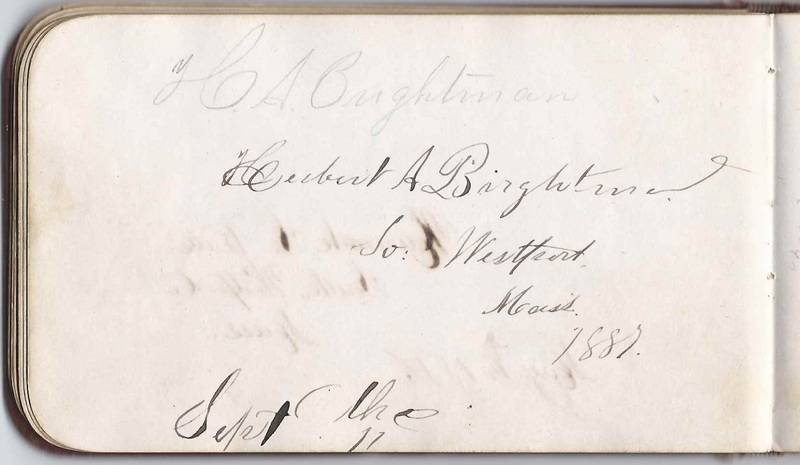 One signer mentioned W.H.S., which might have been Westport High School. 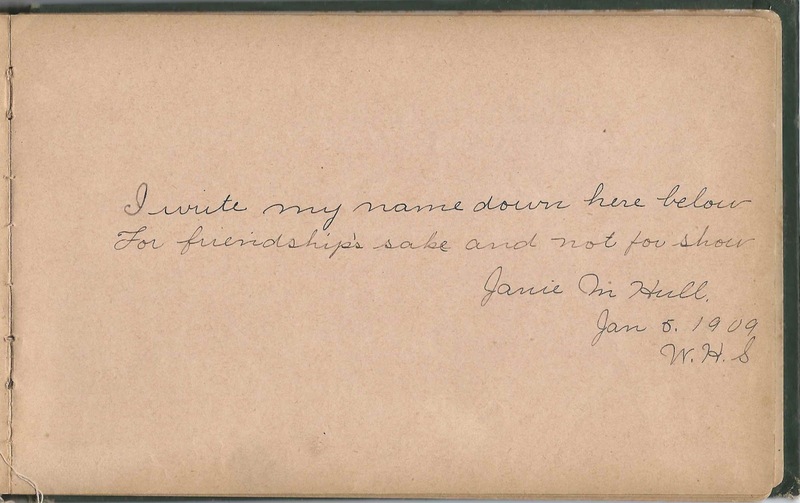 That signer was Janie M. Hull, who signed on January 5, 1909. Several signers indicated they were in the Class of 1911 at Rogers and Allens' school. 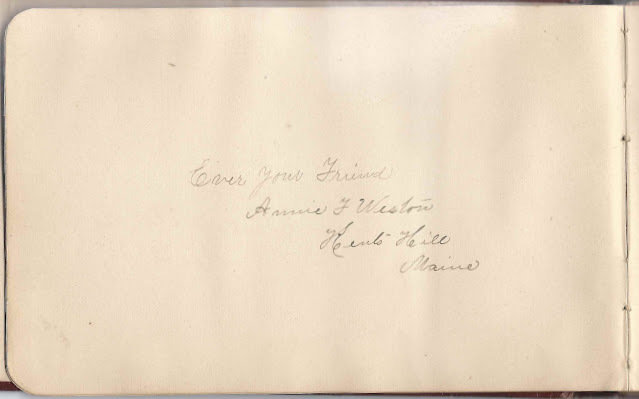 One of these was Elsie Hathaway of Pottersville, Massachusetts, presumably at Somerset, Massachusetts; she signed her page on January 26, 1911. 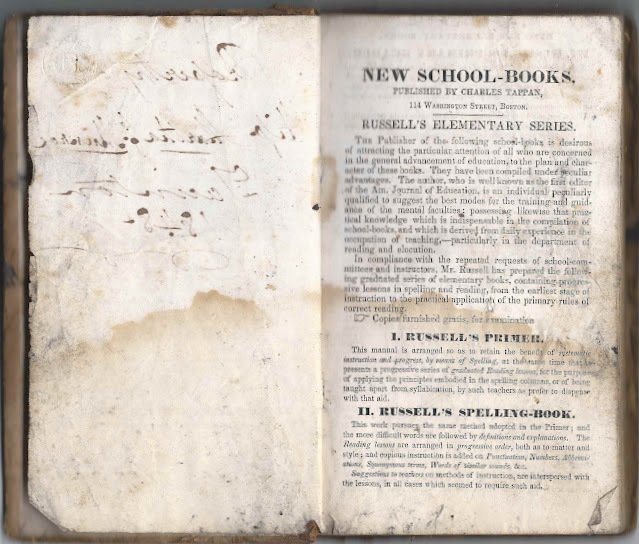 Other Rogers and Allens' students were Clarence T. Borden; Cora Brightman of Pottersville, Massachusetts; Miriam Marsden of Fall River, Massachusetts; Miriam A. Murray; Anna Gertrude Wood of Swansea, Massachusetts, the above mentioned Leslie E. Livingstone; and possibly more who didn't mention their school affiliation. 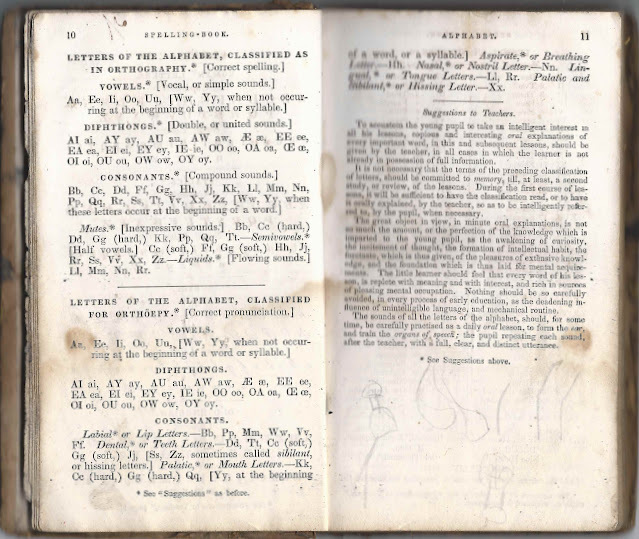 If you have a theory as to the identity of album owner Viola, or if you have information on any of the signers listed below, please leave a comment or contact me directly. Thanks! 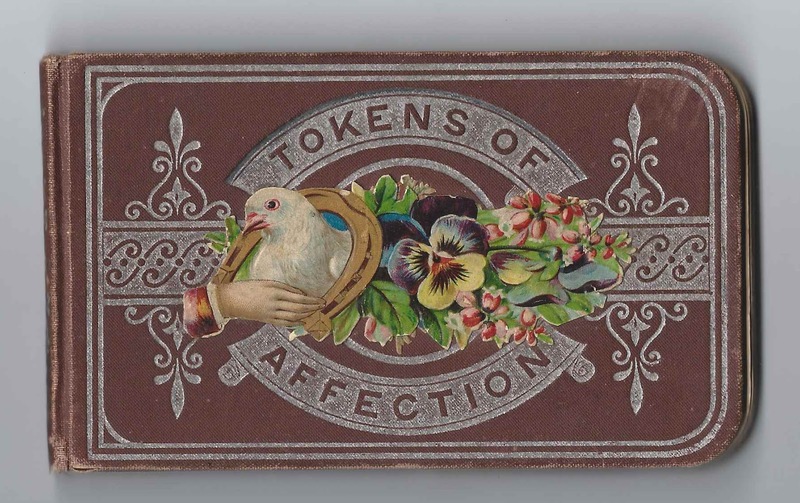 Helen Audella, signed on February 8, 1911; she implied that the album owner's name was Viola. 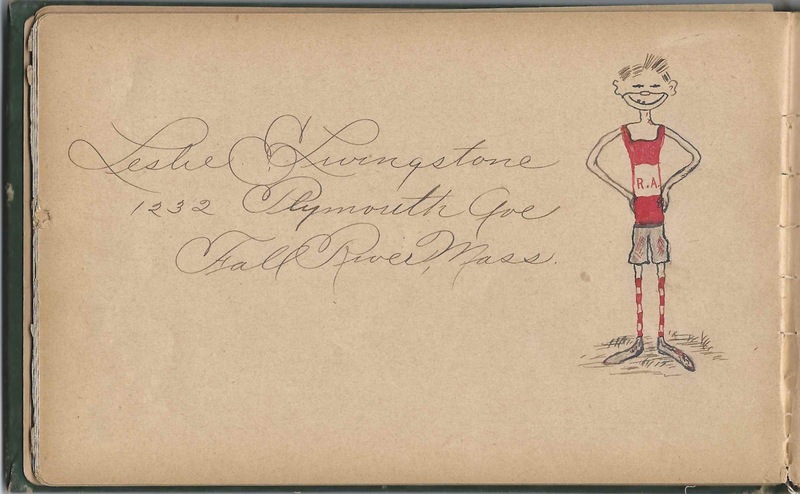 Leslie E. Livingstone of 1232 Plymouth Avenue, Fall River, Massachusetts; he sketched himself in a Rogers & Allens' jersey and tucked his calling card in the album. G. W. Sherman, signed on January 24, 1909; he noted that the album owner was 16 years old. 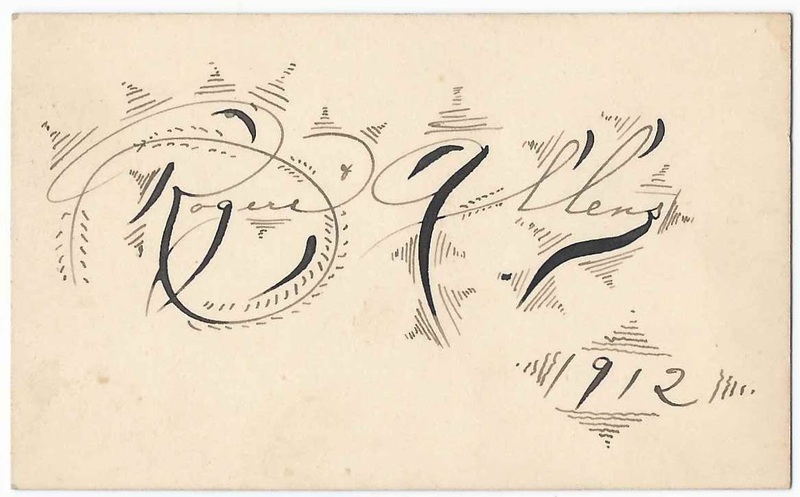 Lillian B. Sherman of Westport, Massachusetts; signed on December 28, 1908. 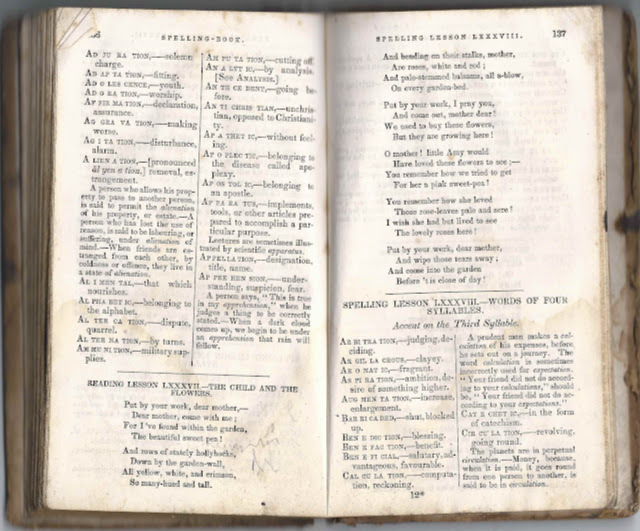 Mentions Padanaram and refers to the album owner as Viola. 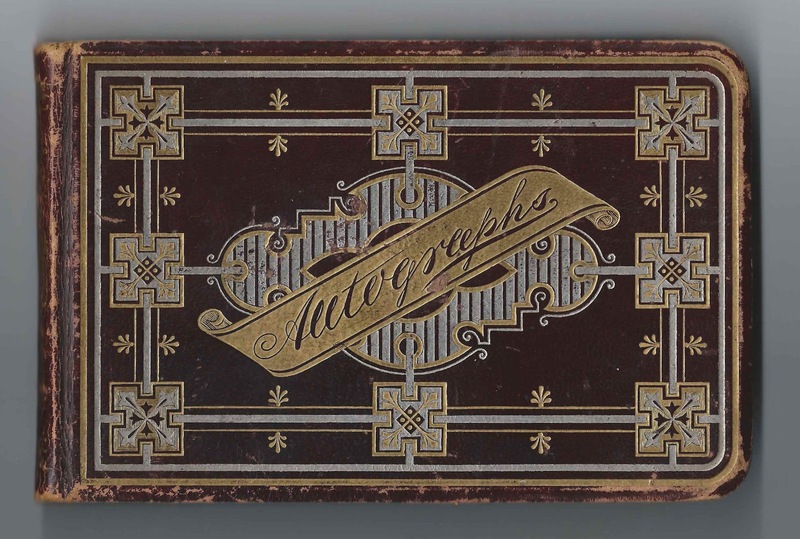 1879-1880s autograph album that belonged to Ella M. Wadsworth, or Mary Ella Wadsworth, of Holliston, Massachusetts. The albums contains many pages signed by people in the Holliston, Massachusetts, area, and in Pawtucket, Rhode Island, where Ella and her parents moved at some point after 1880. 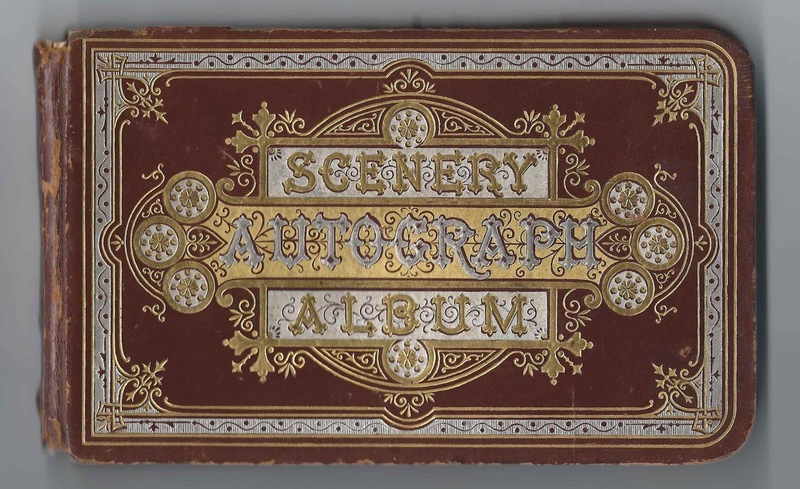 See other posts that feature an 1875-1877 autograph album and an 1878-1880s autograph album that belonged to Ella's brother John Franklin Wadsworth. The album is approximately 7" x 4-1/4" and contains the sentiments of 66 of Ella's relatives, schoolmates and friends. 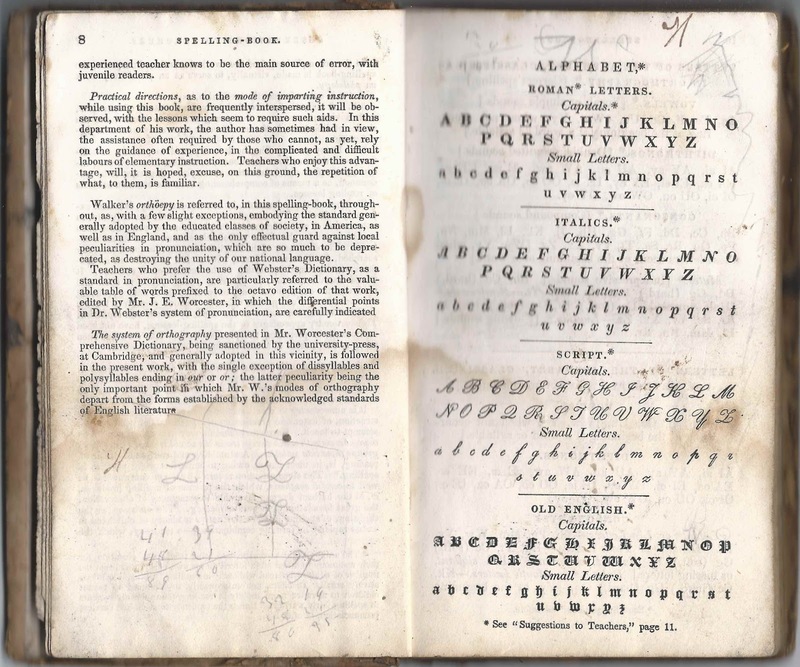 An alphabetical surname list and an alphabetical list of signers, complete with any family relationship, school or residence information, appears at the end of this post. 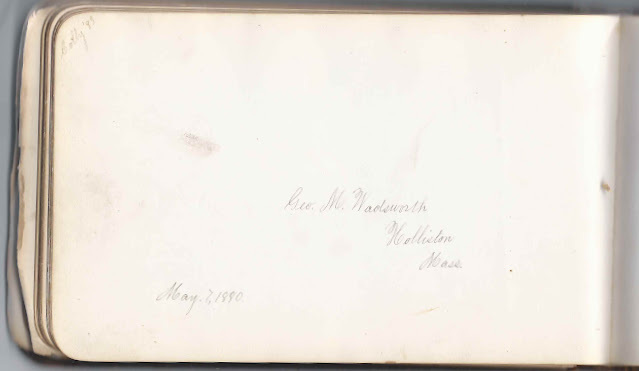 Mary Ella Wadsworth was born 28 October 1860 at New Sharon, Maine, the daughter of John and Elizabeth (Leonard) Wadsworth, who were born in Maine and in Massachusetts respectively. 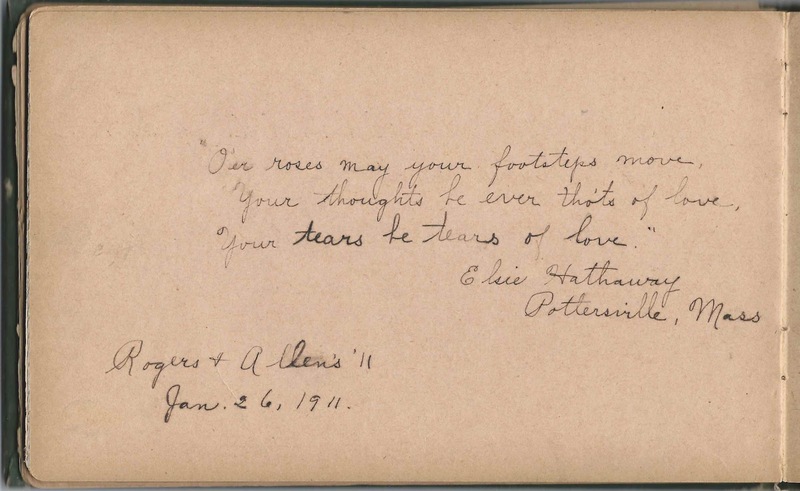 Ella's parents signed a page in her album. 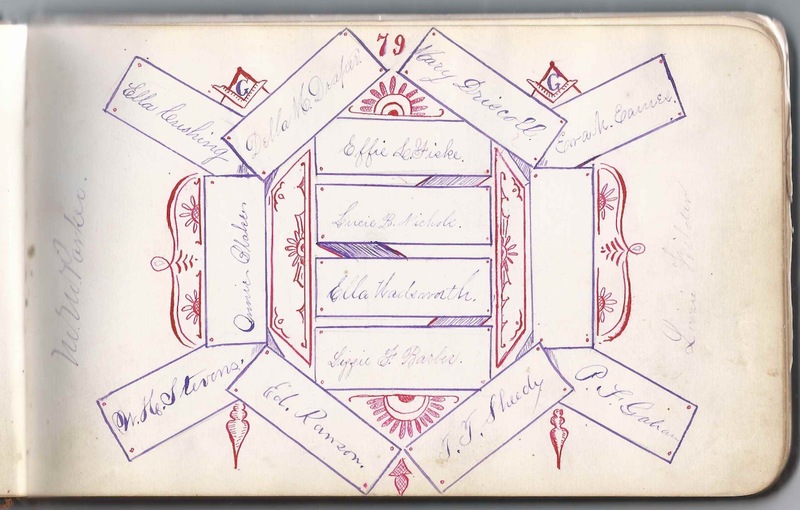 Ella had six siblings, only one of whom, George Melvin Wadsworth, signed a page in her album. To see the handwriting of Ella's other siblings, use the links above to view the posts on the two autograph albums of her brother John Franklin Wadsworth. 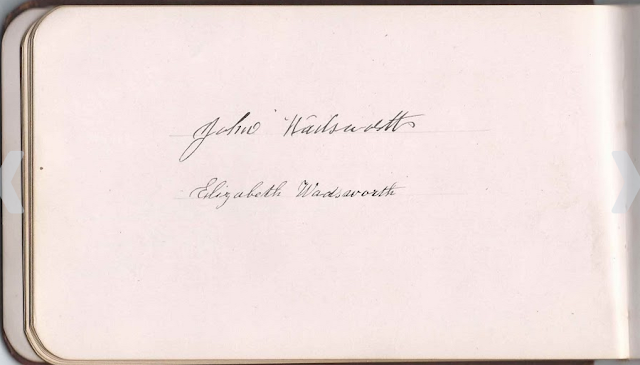 George Melvin Wadsworth signed his page as G. M. Wadsworth on a set of facing pages signed by 17 students at the Willard School. 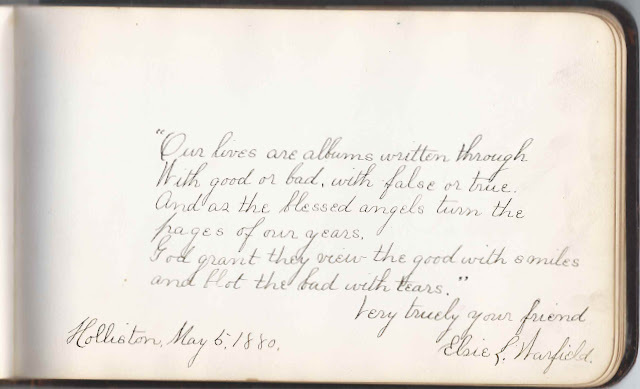 A comment left on a post that featured the 1878-1885 autograph album of a Nellie ? 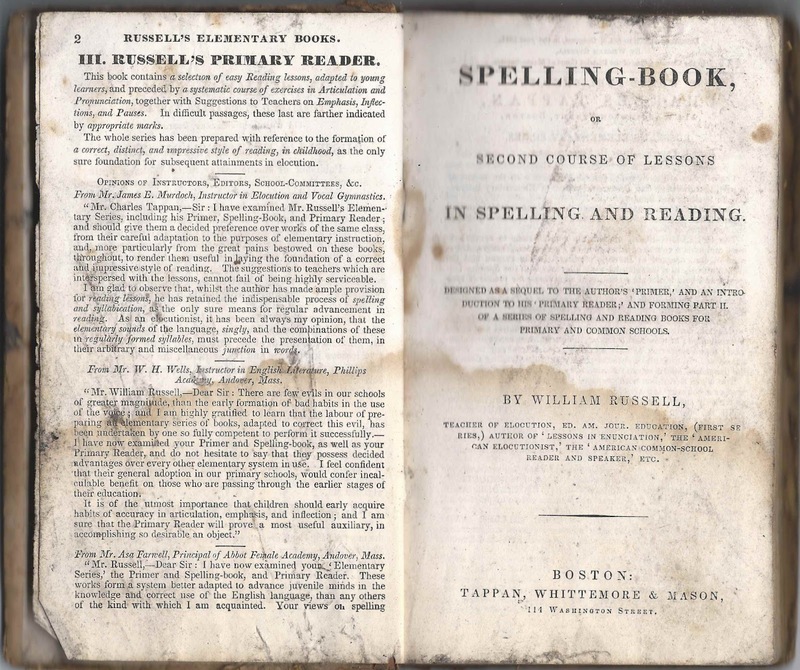 of the Boston/Quincy, Massachusetts area indicated that Theresa Fegan and Nellie Fegan, presumably Theresa Fegan and Ellen B. Fegan below, were teachers at the Willard School at Quincy, Massachusetts. 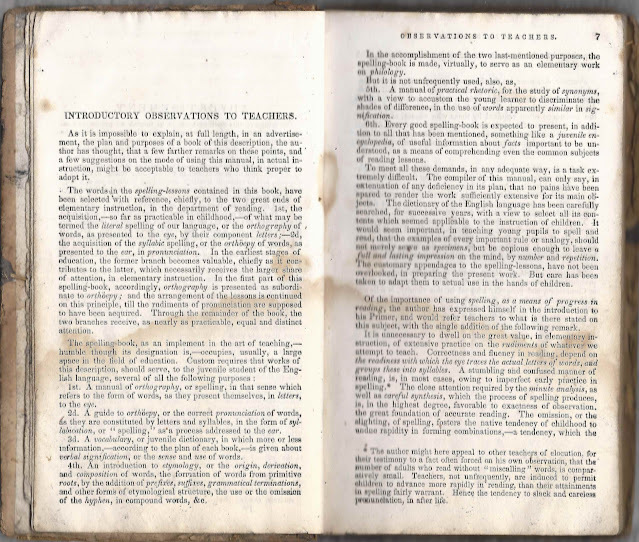 The pages below are undated; I don't know whether the signers were students, teachers or a combination of the two. 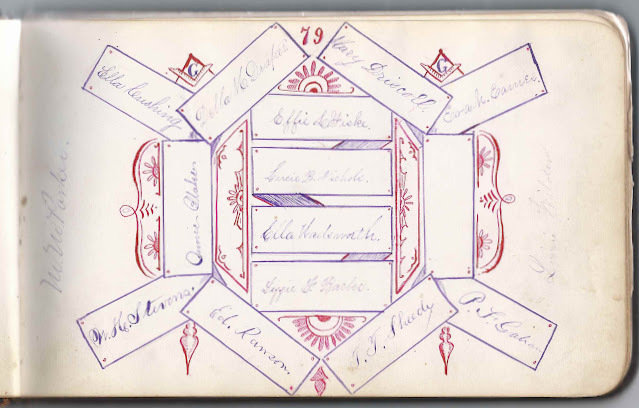 Signers on the facing pages above: 1) Alice E. Sanborn; 2) G. M. Wadsworth [presumably Ella's brother George Melvin Wadsworth]; 3) Nellie S. Dickey; 4) E. A. Desmond; 5) Rose W. Lewis; 6) Gertrude L. Gardner; 7) Ellen B. Fegan; 8) Jennie A. Corliss; 9) Mary Conway; 10) E. A. Newcomb; 11) Georgia M. Glines; 12) Theresa Fegan; 13) R. M. Chamberlin; 14) Grace L. Shaw; 15) Annie F. Burns; 16) Abbie H. Kelley; 17) J. M. Billings. 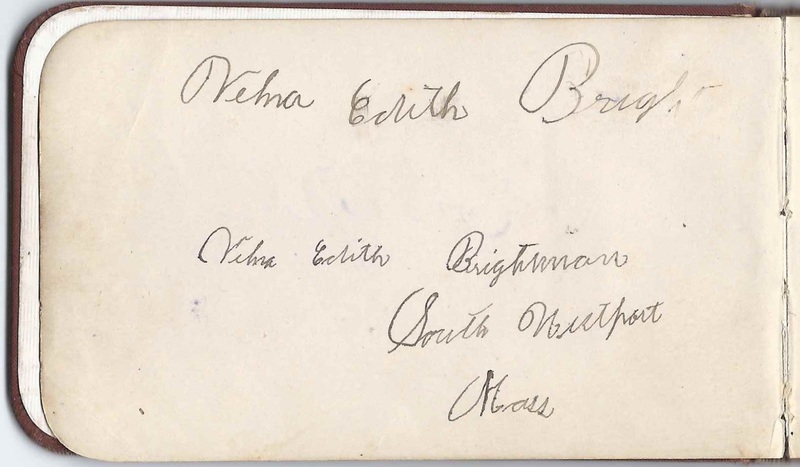 Ella signed a page as part of as group of 14 students in the Class of 1879 in the later album of her brother John Franklin Wadsworth. 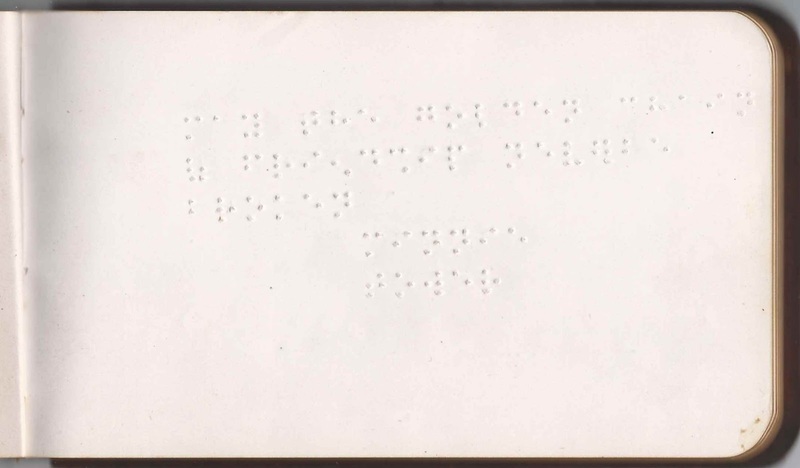 Signers: 1) Ella Cushing; 2) Della M. Draper; 3) Mary Driscoll; 4) Eva M. Eames; 5) Effie L. Fiske; 6) Lucy B. Nichols; 7) Ella Wadsworth; 8) Lizzie F. Barber; 9) Annie Blake; 10) W. H. Stevens; 11) Ed. Rawson; 12) T. T. Sheedy; 13) P. F. Gahan; 14) M. M. Parker [One or both M could be a W]; 15) Lizzie Wilder. In the 1880 Census, "Ella" was shown as living at Medway, Massachusetts, with her parents and brothers Charles and Arthur. 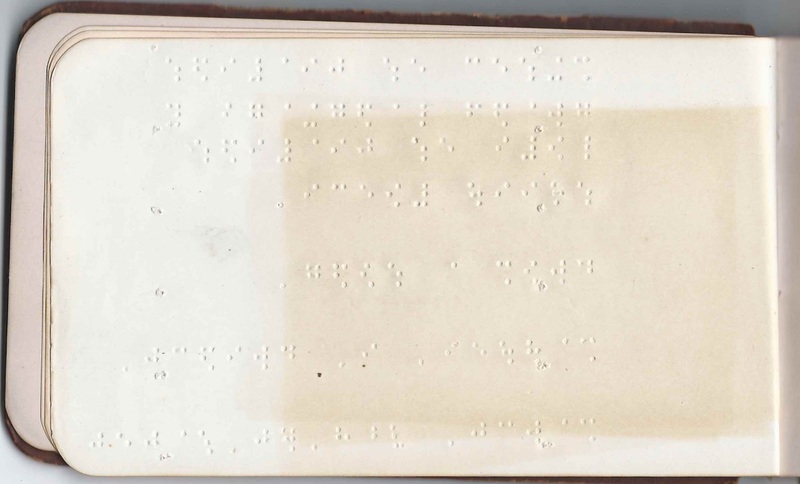 At the time of the enumeration of the 1900 ["Mary E."] and 1910 ["Mary Ella"] Censuses, she, a schoolteacher, and her parents were living at Pawtucket, Rhode Island. 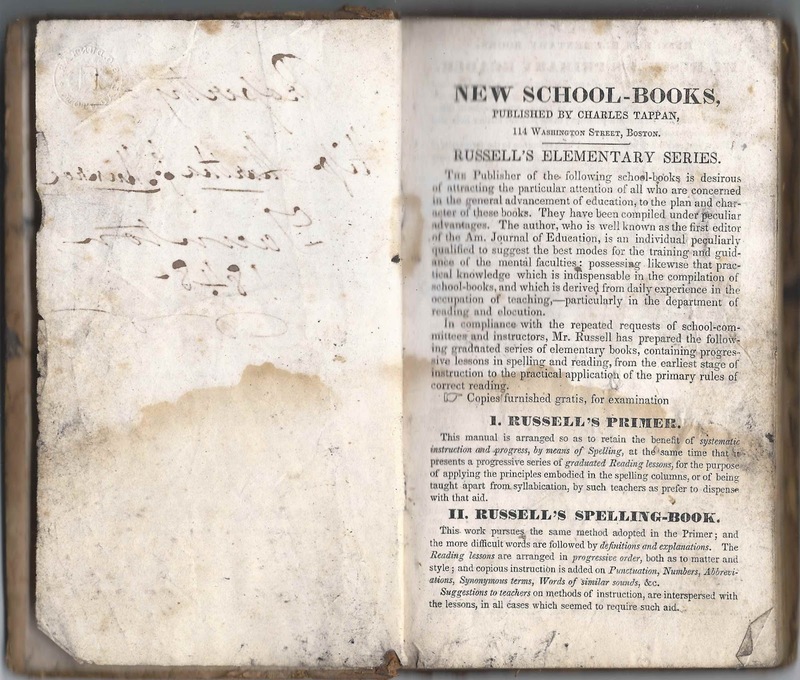 By 1920, Elizabeth (Leonard) Wadsworth had died; "M. Ella", a music teacher in a public school, and her father were still at Pawtucket. 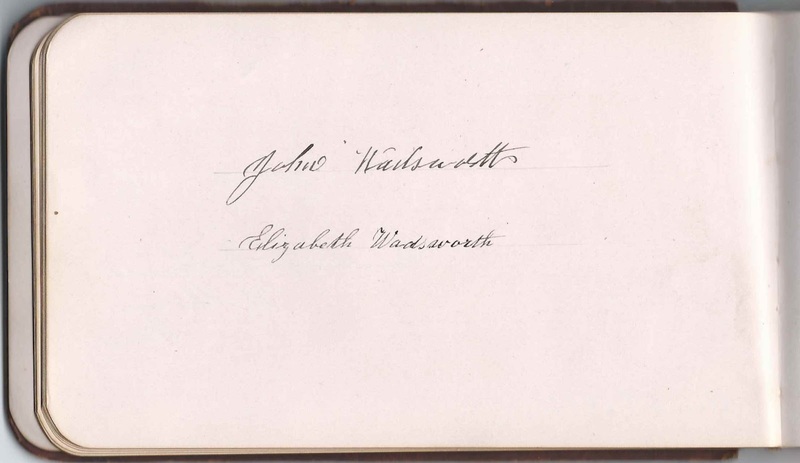 By the time of the 1930 Census of Pawtucket, John Wadsworth had died, and "Ella M." was still teaching, at the age of about 70. 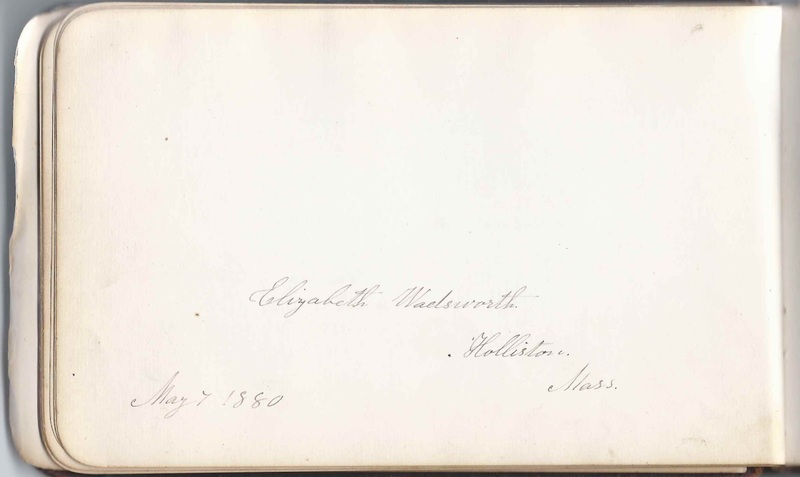 It's interesting that she referred to herself as Ella M. Wadsworth in her album and in the 1930 Census, when there was no one else to speak for her. 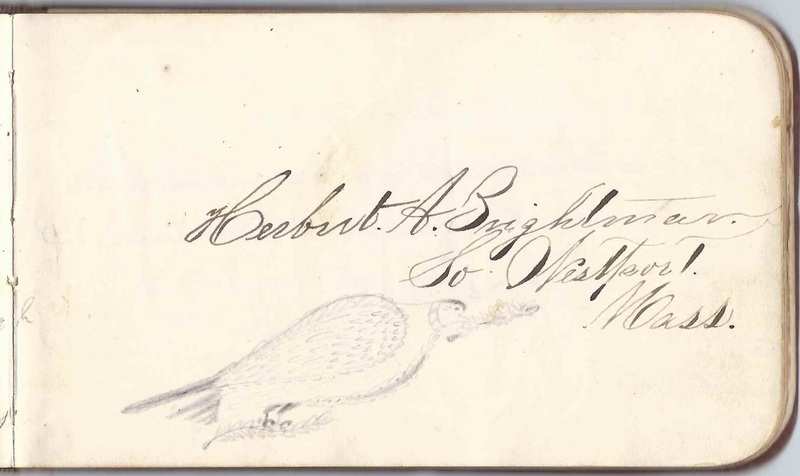 Albert A. Bennett of Middletown, Connecticut, signed on September 30, 1879. 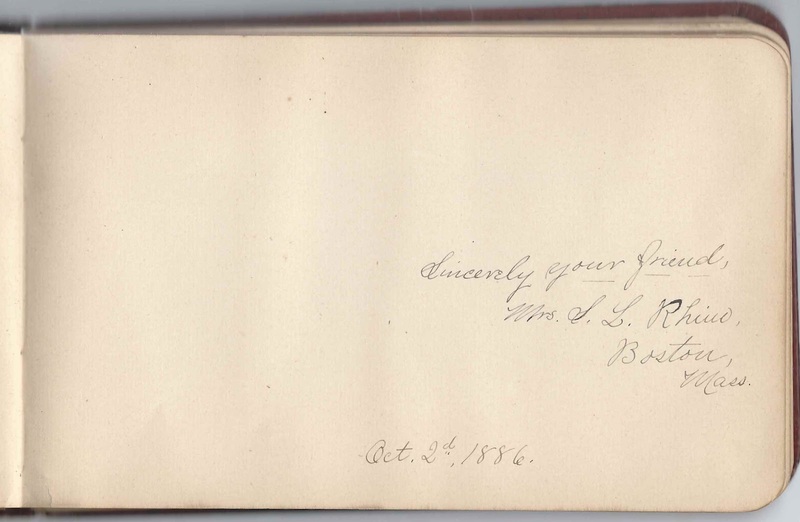 His wife Mela (Barrows) Bennett signed the right facing page. 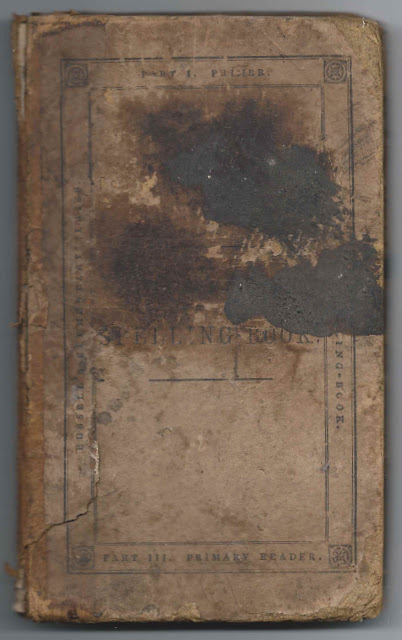 Mela Barrows Bennett of Middletown, Connecticut, signed on September 30, 1879. Her husband Albert A. Bennett signed the left facing page. 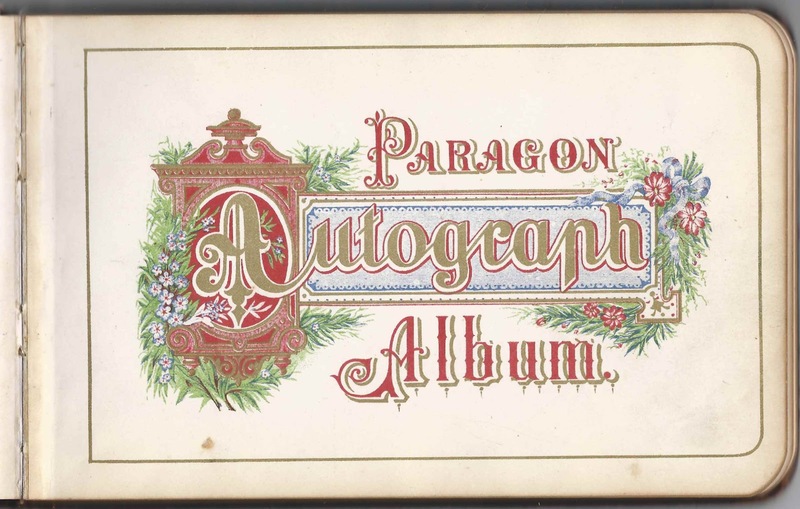 Bertha L. Clark of Pawtucket, Rhode Island, signed "Day after the Fourth, 1880"
Edwin W. Colburn of Holliston, Massachusetts, signed on December 5, 1883. 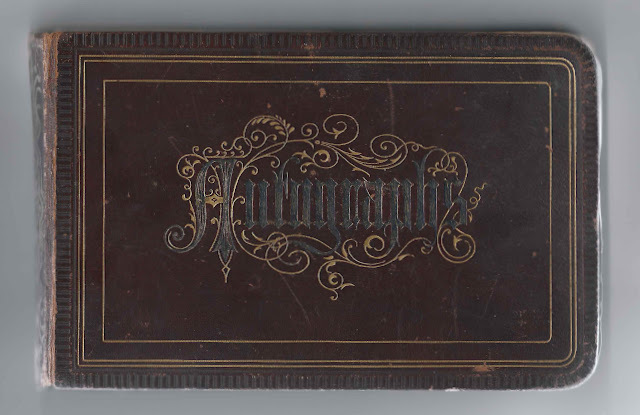 Presumably Edwin Wilkinson Colburn, either the father or the son. Sarah Frances (Dickinson) Colburn, who was either the wife or the mother of this signer, signed the following page. 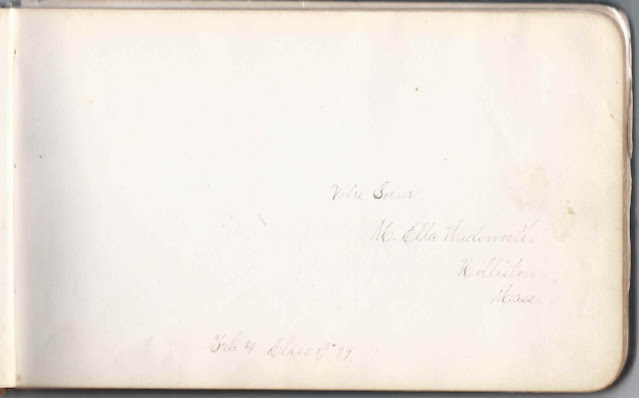 Sarah F. Colburn of Holliston, Massachusetts, signed on December 6, 1883. She was Sarah Frances (Dickinson) Colburn, whose husband Edwin Wilkinson Colburn or son of the same name signed the previous page. 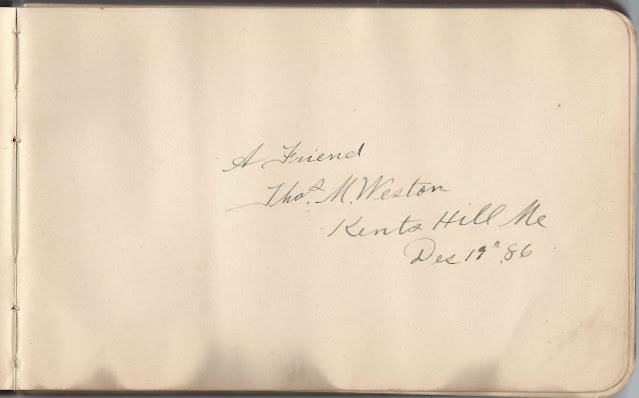 D. W. Freeman of Holliston, Massachusetts, signed on October 10, 1879. 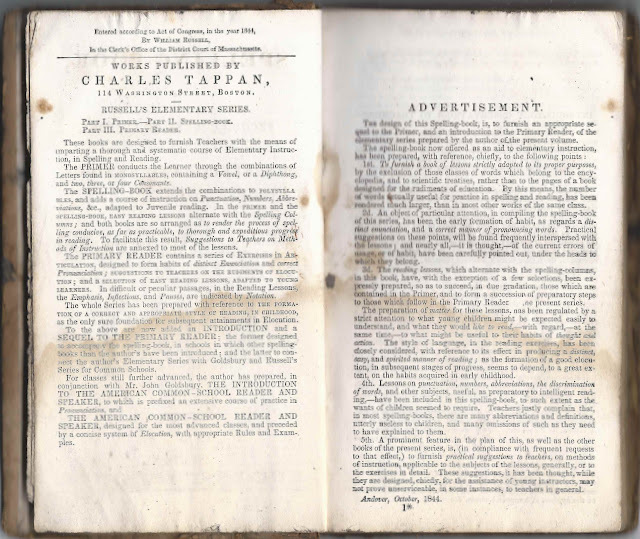 He was Daniel W. Freeman, whose wife Marion A. 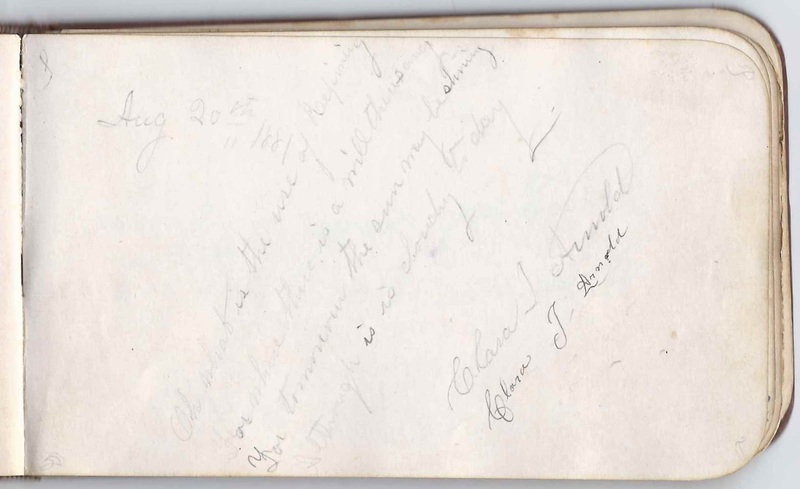 (Olcott) Freeman signed the right facing page. 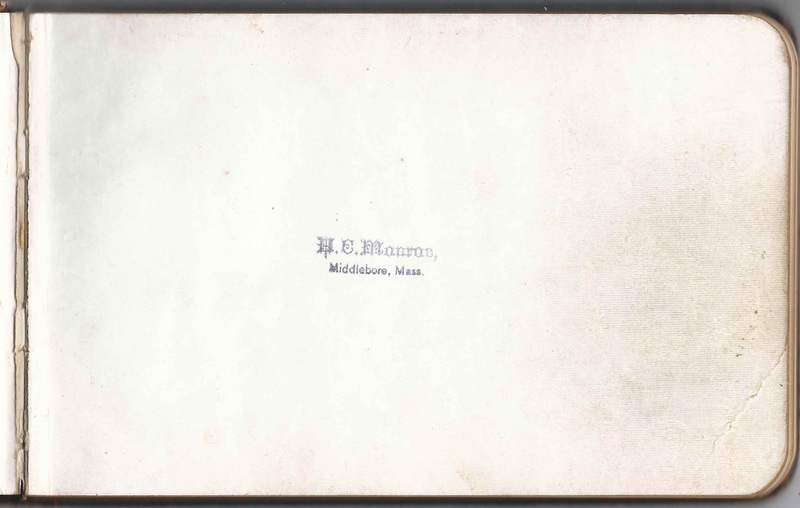 Marion A. Freeman of Holliston, Massachusetts, signed on October 10, 1879. 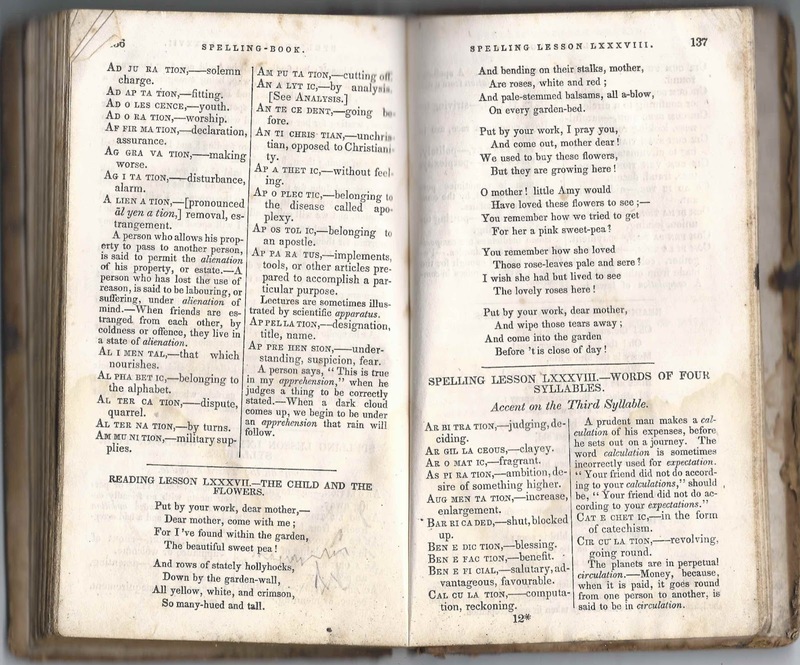 She was Marion A. 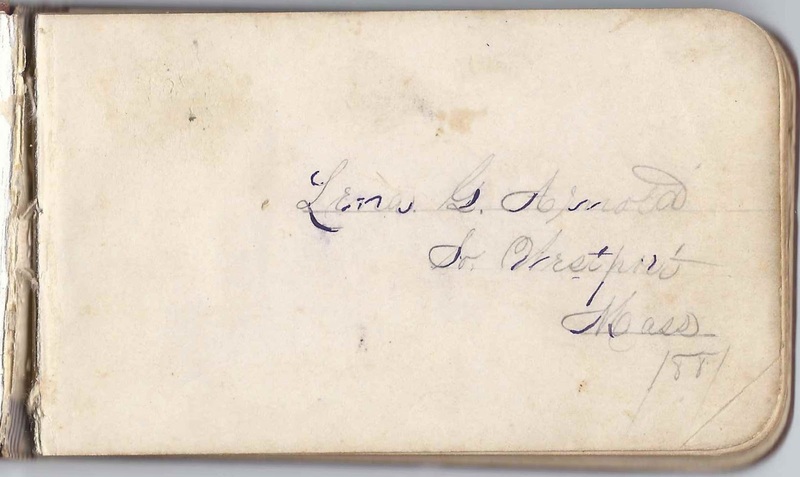 (Olcott) Freeman, whose husband Daniel W. Freeman signed the left facing page. Clara A. Lowd of Holliston, Massachusetts. 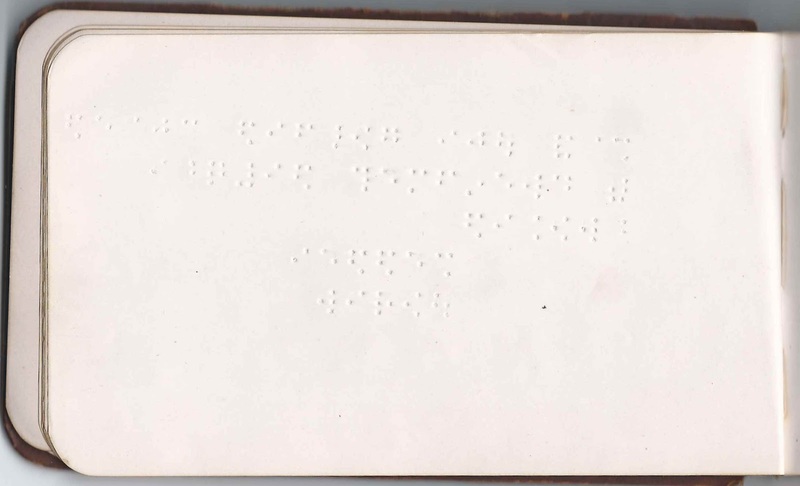 She was Clara A. (Stuart) Lowd, who shared the page with her husband Albert Leavitt Lowd. 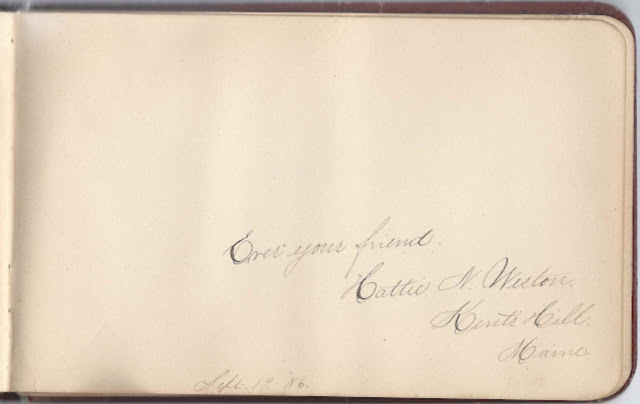 L. Wadsworth Tuck; "your cousin". 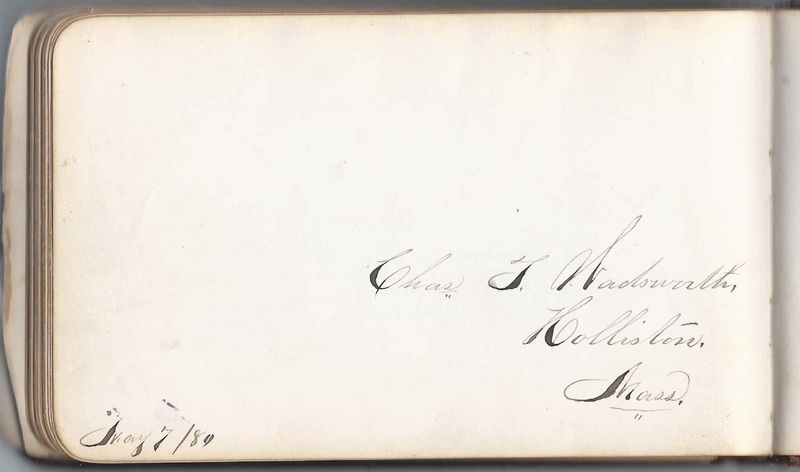 He was Lorenzo Wadsworth Tuck. 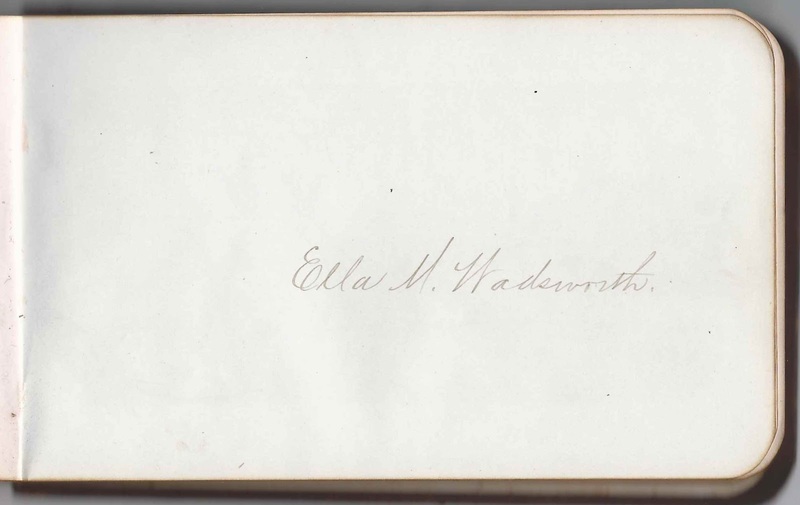 Ella M. Wadsworth, album owner, who wrote her name in the album. She may also have been known as Mary Ella Wadsworth. Elizabeth Wadsworth. 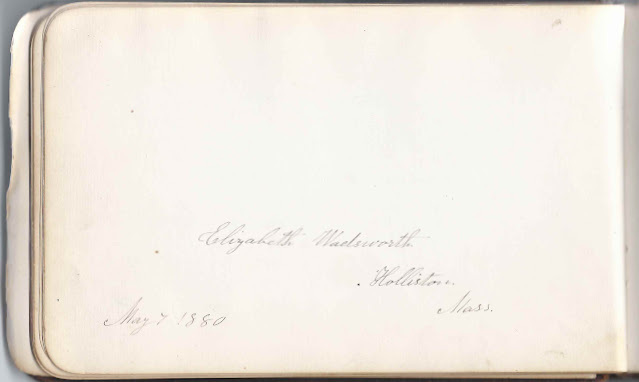 She was Elizabeth Leonard Wadsworth, mother of album owner Ella M. Wadsworth [or Mary Ella Wadsworth] and wife of John Wadsworth, with whom she shared the page.